Is India’s independent foreign policy really ‘independent’? Is the country’s political leadership capable of withstanding external pressures and formulate India’s strategic relationship with the world and can the diplomatic corps implement them assiduously? How prepared is India to face the rapidly-evolving challenges of the 21st century? Is the successful passage of the nuclear deal with the US a diplomatic victory for India? One would expect affirmative answers to the above questions, especially when they come from a seasoned diplomat who served in the ministry of external affairs for 36 years. But Rajiv Sikri sheds such diplomatic niceties and bluntly states in his book “Challenge and Strategy: Rethinking India’s foreign policy” that India’s current foreign policy lacks perspective and needs a thorough overhaul. 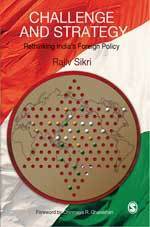 Sikri addresses all these issues and more in his book, through which he analyzes India’s foreign policy through the eyes of a critic. Sikri believes India has the potential to become a global leader. But for that, India’s ‘tilted’ foreign policy needs to be set right. The author is piqued at the fact that India’s foreign policy, especially in the wake of the nuclear deal, is skewed heavily towards the US. He cautions the dangers of blindly toeing the US line on international affairs. He points out that the US only started taking India seriously after the Pokhran II in 1988 and that the new-found friendship on nuclear energy is actually aimed at smothering India’s sovereignty. Sikri gives a careful dissertation on the history of India’s relationship with different regions of the world. There are chapters that delve deep into history, to the extent of boring, but the author offers fresh ideas to make up for it. For example, Sikri says the genesis of the conflict between Tamils and Sinhalese in Sri Lanka is religion; the Sinhalese consciously embraced Buddhism to alienate Tamil nationalism. He also warns that China’s silence on border disputes with India will pose dangers in the coming years. The Chinese waited patiently till 1997 for Hong Kong’s 99-year lease with the British to expire, to get back the province. So, there could be a danger lurking in China’s claim over Arunachal Pradesh; the Chinese may just be waiting for the opportune time. However, the chapter on Indo-US nuclear deal shadows all other chapters in the book. Given the passion with which it has been written, I suspect the author wrote this book primarily to vent his strong views on the nuclear deal; the other chapters are just layers that have been added to make it look like a wholesome book on foreign policy. Sikri is a known critic of the nuclear deal. Through various articles and opinion pieces he has questioned the veracity of the deal. Through this book, however, he goes further and hints that the handling of the deal by the Indian side was not tactful enough. I suspect Sikri was gleefully targeting former foreign secretary Shiv Shankar Menon and Prime Minister Manmohan Singh who spearheaded the deal. There is a personal angle to Sikri’s opposition to the nuclear deal. Sikri was one of the top contenders for the foreign secretary’s post in 2006, which fell vacant following Shyam Saran’s term ended. Sikri, who was secretary (east) in the ministry of external affairs, created ripples in diplomatic circles when he took premature retirement after he lost the race for foreign secretary to Shiv Shankar Menon, who was junior to him in service. No other issue has tested the mettle of India’s foreign policy in recent times than the highly controversial Indo-US nuclear deal. With both supporters and critics deciphering the nuances of the deal, it put political parties, scientist community and even the media in both camps. No wonder the diplomatic corps were also divided on the issue. Sikri’s contention is this: the US never meant the nuclear deal to be in India’s favour; it simply wanted to nudge India into the non-proliferation treaty (NPT) and thereby closing the route for nuclear weapons programmes. But Manmohan Singh did not realise this and went ahead projecting the deal as a panacea for all of India’s energy needs. Sikri leaves nothing to imagination when he says it took Indian negotiators’ skills in “semantic jugglery” to bridge the irreconcilable gaps in the controversial provisions of the Hyde Act and the prime minister’s assurances in the Parliament to the contrary. Sikri does not mince words when he says Indian officialdom, even at the highest level, took the lofty line that the deal was all about civilian nuclear energy. Sikri, for one, doesn’t believe that the nuclear deal will bring energy security to India. In fact, to buttress his point, there is a separate chapter on energy security, which quotes profusely from the Planning Commission’s “Integrated energy policy”. According to which, even if nuclear energy production grows 30-fold by 2030, it can meet only 4 per cent of India’s energy needs then. The author says that while the US was open about the deal, Indian government position was shrouded in mystery. At one point, Sikri even hints at “confidential agreements” between the Indian government and the US. If such documents indeed exist, that would be scoop for newspapers. Pity Sikri hasn’t given more details about such agreements. There are other controversial insinuations. At one point, Sikri says that the prime minister was pressurized to appoint only those who shared the views of the US policies in key positions and that those who opposed, were removed from important posts! I suspect Sikri was finding himself a reason for not being selected for the foreign secretary’s post. Sikri ends the book by saying India needs to change its tactics and draw inspiration from its own rich past, rather than being a stakeholder in the new, US-led international system. In other words, the American dream is dead; so there is no point in giving away India’s destiny into the US’s hands.